Your little girl will absolutely love keeping all of her treasured memories in her very own Personalized Keepsake Box. 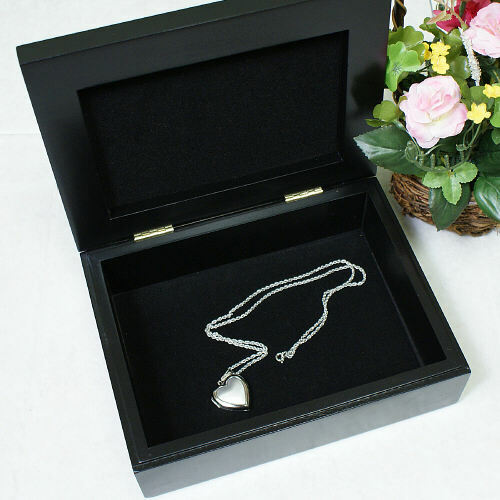 Our beautiful black wood personalized memory box measures 8"Lx6"Wx2¾"H and is perfect for holding her special mementos, such as concert tickets, favorite pieces of jewelry or personal letter from a far off friend. Includes FREE Personalization! Personalize this keepsake box with any name. Additional Details Be sure to look at our entire collection of Personalized New Baby Girl Gifts. We know you will find many beautiful personalized gifts for the new, little baby. GiftsForYouNow.com offers many unique Personalized Baby Apparel, Personalized Picture Frames & Much More.